Anyway... this is a man's recipe for a big ole' southern pecan pie, made with brown sugar, corn syrup, butter, vanilla, and pecans... followed up with a great dessert. You can either wear your man-apron and make the flaky pie pastry below; or you can man-up and go get a store bought pie crust of the unbaked refrigerated/frozen variety. It don't make any difference. Just throw some of this on her plate, and get ready for dessert. Put all the flours, sugar, and salt in a margarita blender. Click the switch (pulse) it a few times to combine all the stuff. Throw some pieces of butter over the flour mixture, and stir it around some, then click the switch on your blender about 6 times. Throw in the shortening pieces over the mixture, stir in lightly, then click that switch about 6 to 7 more times. Sprinkle that goo with about half of the water. Click that switch again for about 5 times. Throw in the remaining water, the click the switch about 6 times, until dough begins to clump. Empty the large pieces into a bowl. Pack em and then push down on em with your palms (knead )just 2 or 3 times. Wrap in plastic wrap and chill for about 1 hour. Throw it out on a table you got floured up...so it don't stick to the surface. Make it a little bit bigger than the size of the pan you're going to cook the pie in. Fold it over and fit into the pan, cutting off the extra stuff.. Using the top of a beer can, tap around the edge of the crust to make it look pretty. Before adding the filling, brush with a little of the beaten egg white. Throw the eggs, corn syrup, salt, vanilla, brown sugar, and melted butter in a big bowl. 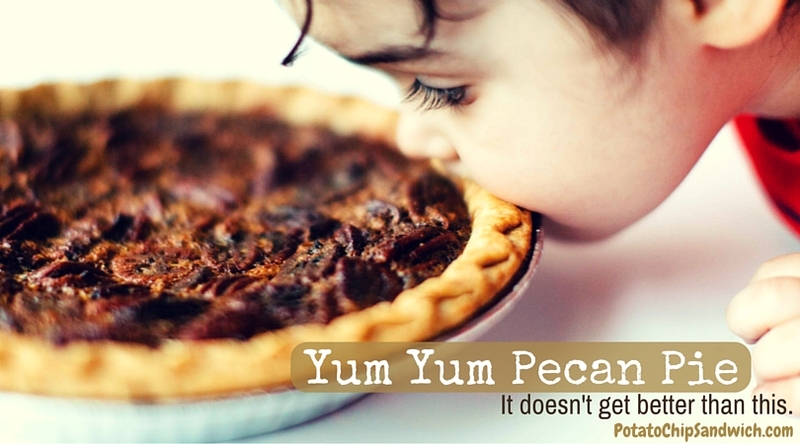 Stir in pecans and then pour into the pie shell. Bake at 400° F. for 15 minutes; then reduce the heat to 350° and bake for about 25 to 30 minutes longer. If you look in the oven and the edges are getting real dark, pull it out of the oven and cover the crust edge with tin foil. Let the pie cool completely on a rack. Serve with whipped cream or whipped topping or a scoop of vanilla ice cream. Be sure to save some of the whipped cream for dessert. ps: If you really want to make this rock, then bake the pecans in butter and salt at 350 for about 30 minutes. Make em nice, toasty, and crisp. A sure winner for those that love nuts! Like ME!! !